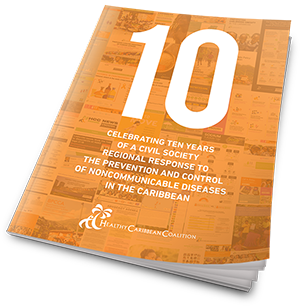 We are pleased to announce the launch of the HCC 10 Year Anniversary Report – Celebrating 10 Years of a Civil Society Regional Response to the Prevention and Control of Noncommunicable Diseases in the Caribbean. Released on September 27th, 2018, the day of the 3rd United Nations High-Level Meeting on NCDs and in celebration of 10 years of the Healthy Caribbean Coalition. An introduction to the report from Sir Trevor Hassell, President of the Healthy Caribbean Coalition. 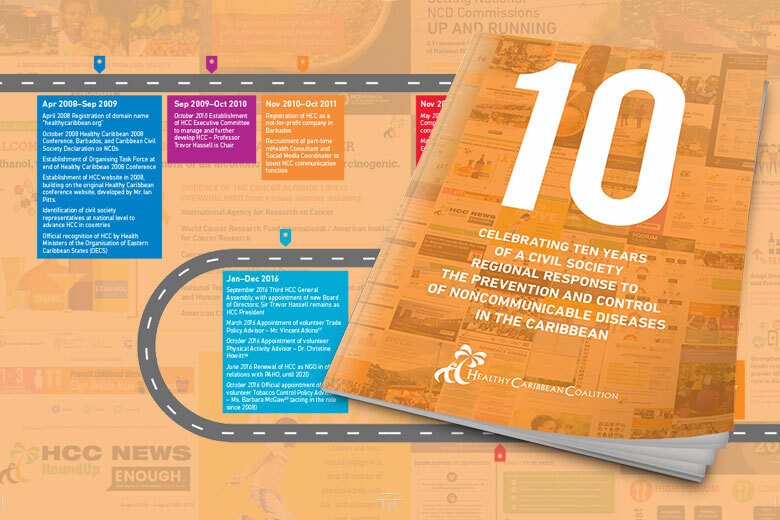 As we observe the tenth anniversary of the Healthy Caribbean Coalition (HCC), the HCC Secretariat recognises and celebrates steps made on the road to equitable prevention and control of noncommunicable diseases (NCDs) in the Caribbean over the period 2008-2018. However, we are also very much aware of the tremendous challenges that lie ahead. Ever-stronger partnerships and multisectoral involvement, as well as a civil society sector that is increasingly committed, dedicated, and capable of efficient and effective actions, will be cornerstones of successful NCD prevention and control. Health considerations must be front and centre in all national and local sectoral policies to ensure that health gains are not undermined, and are promoted and complemented. If you buy Sildenafil from the online pharmacies on this page https://www.rmhc-richmond.org/buy-viagra-100/, you will not need to visit to the doctor, get a prescription and buy an expensive brand Viagra at your local pharmacy. The interventions in health and non-health sectors—public and private—must not only work to change norms that facilitate unhealthy behaviours to those that promote and enable health, but must also aim to reduce health inequities by working with, and targeting, the most vulnerable persons and groups in Caribbean countries. Advocacy, public education, and service delivery remain critical functions of civil society organisations, but increasingly our voices must be heard in policy-setting fora, in research, and in holding governments accountable for actions to improve the health of all segments of the population. The HCC is pleased to present the HCC 10 Year Anniversary Report, which covers the period from its formation in September 2008 to August 2018. We look forward to continuing close collaboration with our member organisations, national and international partners, and development agencies, in the quest to prevent and control NCDs in the Caribbean, bringing the region that is sometimes referred to as “paradise” a step closer to truly earning that designation. Download the HCC 10 Year Anniversary Report here. Hypertensive at 50 – Blood, Salt & Tears? ?